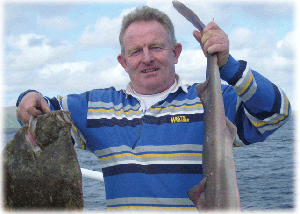 Martyn called me a few times but our Kerry weather was poor eventually we got out last Sunday. The weather was great, light NE wind but with a threat of strong SWesterlies for the evening. Some of the guys hadn’t fished from a boat before, some hadn’r been on the Atlantic & some were good fishermen so we had a mixed crew. Started off as usual with a chat about safety the use of multiplier reels (Penn) I dropped my line to show the guys how to prevent a ‘birds nest’ and I felt a bite and another, wow, I hauled up 3 Coley of about 2kg’s each. We gad a laugh about how easy it is to fish. 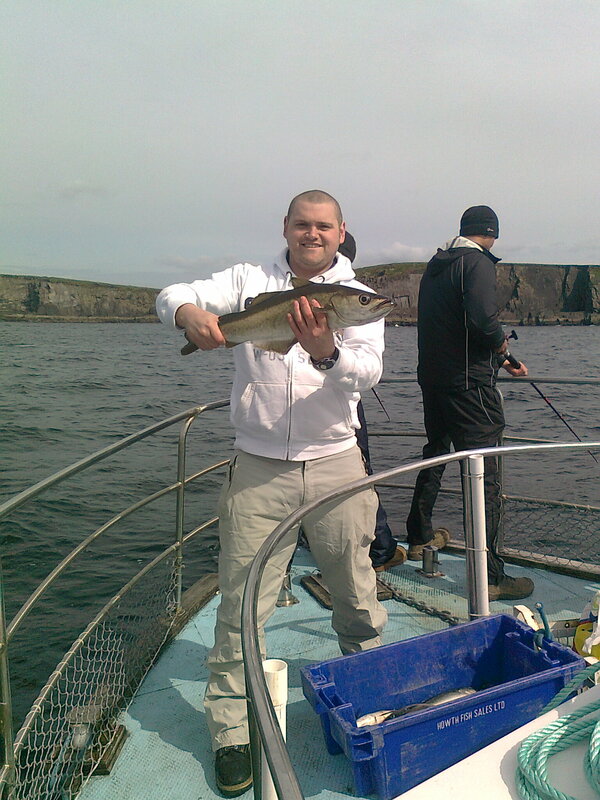 They all started to fish and hook Coley and in no time we had about 20 kgs. 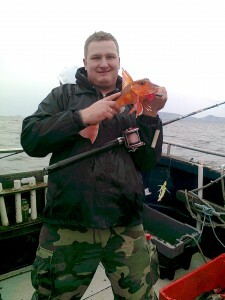 We moved to another spot and after a short time we started to hook Pollack. The only Irishman in the group was Shane from Tralee ha had a fine fish. We stayed on this mark catching more Pollack when from the bow there was a shout of ‘big fish’ as soon as I reached the bow I could see a fine Cod drifting and then swimming back to the bottom, this is the one that got away, but the next time we had a good fish shout I brought the net and gaff the make sure we landed the fish. A Cockoo Wrasse caused some amusement as some of the guys never saw one before, this one had very vivid colours, and went back to the deep. The next move proved to be poor in fish but the scenery and a sudden school of Common Dolphins, up to 20, gathered around us and bumped each other for the best place to ride the bow wave, the stayed for about 20 minutes and were a great treat. 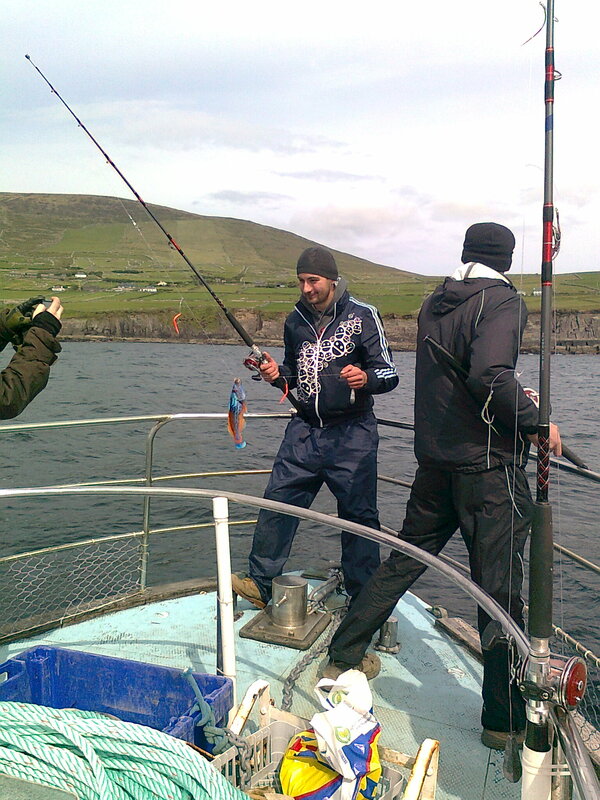 When we went back to the mark things were very slow for a while then again there was a shout from the bow, Mariusz had something ‘big’ on the line. 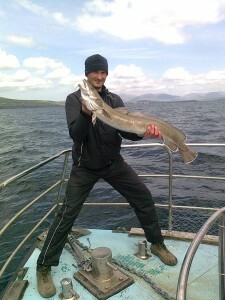 This 6 footer was struggling we thought he had foul hooked a Cod but no, it was much better a large Ling. The fish weighed just under 6 KG’s and was the best of the day. As forecast the winds started to pick up around 3 pm and by 4pm it looked like it was going to get bad but for a change it didn’t. We made our last move closer to the harbour but about 2 miles off. With the flood tide and the SW wind we were drifting pretty fast over our mark when Martyn had a surprise he had never seen before. The fine Red Gurnard caused a bit if a stir and before I could say ‘mind the spikes’ there was a cry ouch ! Our day was a another good outing with a great bunch of guy’s. That was a great fishing with skipper Rory O’Connor and his son. Thanks very much !! !